Valentine's Day will be here soon, are you ready!? 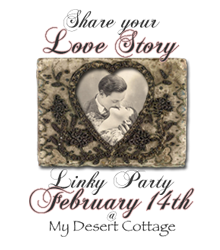 Our sweet friend Karen Valentine (yes, that's her real name)of My Desert Cottage is hosting a great linky party on February 14th, and we're sure you will want to read all the love stories shared there...just to get in the mood. And, to further the romantic-ness of the day, have you read The Pioneer Woman's story of how she met and fell in love with her Marlboro Man? It's a page-turner for sure, you'll LOVE it! You can read from beginning to the wedding day on her blog or buy the new book, available now. Do you have a romance to share? Stay tuned here at The Blog Guidebook for a superb Valentine's Day giveaway.Because we love you!